When you think about Samsung, one thing that comes to your mind is high quality and advanced technology. In whatever field, the South Korean manufacturer has never disappointed, and the Samsung WF12F9E6P4W 12kg 1400rpm WiFiecobubble Washing Machine is not an exception. This washing appliance is enormous and loaded with features that make laundry fun and convenient or far less of a chore. The first aspect you notice with the machine is not technology but the large size of the appliance. If boasts an enormous 12kg washing capacity which makes it one of the most commodious washing appliances on the market today. What’s more, the machine can comfortably hold at least 60 T-shirts or a significant amount of large duvets and to be honest; you’ll hardly find a larger appliance for home use. To ensure you don’t overload the super machine, it has the smart sensing load function that will analyze the weight of smaller loads to let you know the exact amount of detergent, water, and energy to use. A feature that sets this model apart from the rest is the ecobubble technology that enables the machine to wash at cooler temperatures which saves loads of energy or precisely money. Just like the Samsung mobile devices that save big, this machine has incorporated that which makes it very economical to use in laundry. The ecobubble technology involves a bubble generator that dissolves a detergent into the water and immediately injects air which produces a foamy cushion that needs less hot water to aid cleaning. Better yet, it penetrates deeper into clothes at a faster rate than the conventional washers and uses an incredible 30% of the energy. You can wash clothes excellently in cool water just like you would do with warm water. The amazing washing machine features built-in Wi-Fi which implies that you can use your smartphone App to control the washing from the comfort of your couch. On top of that, it features the Smart Check control feature which allows you to diagnose any issues that may arise with the machine. This offers an easy troubleshooting solution using an app. As a result, it saves you time and money that you’d have used to consult an engineer. However, this amazing feature is only available for iPhones and Android devices. Do need a peaceful washing time? 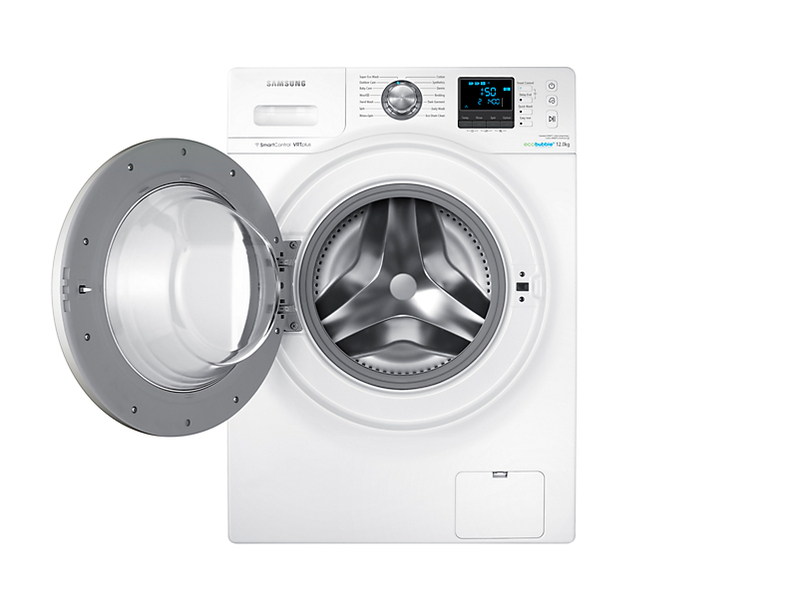 Well, the Samsung WF12F9E6P4W features the VRT Plus Technology which ensures there is less noise and vibration during washing like with most washers. This allows you to do the washing anytime without disturbing others. Better yet, it has the 3D vibration sensor that keeps the drum flawlessly balanced even at high speeds. One benefit of using the machine is that it saves you a lot of energy. The average energy usage is 198KWh which is unbelievable considering its size. To make it even better, it is incredibly quiet with an impressive 72dB noise emission rating whilst spinning. When you compare it with other machines of similar size, this machine is your perfect choice. It’s the reason why Samsung has been awarded an exceptional A+++ energy rating. The washing machine features a digital inverter motor that delivers excellent cleaning performance, guaranteed durability and energy efficiency. Samsung also eliminated the use of brushes which makes it even more long-lasting. To give you peace of mind and guarantee, the machine has been backed up by a 10-year warranty. 1. Maximum spin speed- the machine features 4000rpm which is a faster spin speed. This means you can get things done fast and clothes come out nearly dry. 2. Numerous cycle programs- The washer offers a wider range of programs to choose from which offers you the chance to choose the most economical and ideal program to use for your cleaning needs. 3. Has a child lock which ensures children don’t interfere with it for safety. 4. Bigger capacity- More weight capacity means that you can wash heavy things like curtains and duvets. This conserves energy. 5. Has a Pause Option- you can stop the machine in case forgot to put something inside or if you need to attend to something urgent. It may use more water, but that’s understandable considering the size of the drum. The Samsung WF12F9E6P4W 12kg 1400rpm WiFiecobubble Washing Machine is very much top end, and you wouldn’t lose a penny for it. The sheer size of the appliance and comprehensive functionality certainly justify the expense. With a 10-year warranty, you definitely have the assurance of longevity.